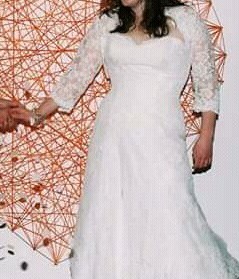 Selling my beautiful wedding dress. Worn once (still very happily married!) and in very good condition, has been professionally cleaned and boxed. Its a size 14 but corset so adaptable sizing to some extent and I'm about 5ft6 and wore a small heel. I have an apple shape but the corset gave me a great figure! I have the sash too (show in the official pics form the internet) in ivory (or some varient of!). The bolero in the pics is not for sale, just the dress. Willing to look into postage if buyer willing to pay or collection from Kendal. Once you send a message, Susie can invite you to purchase the dress.